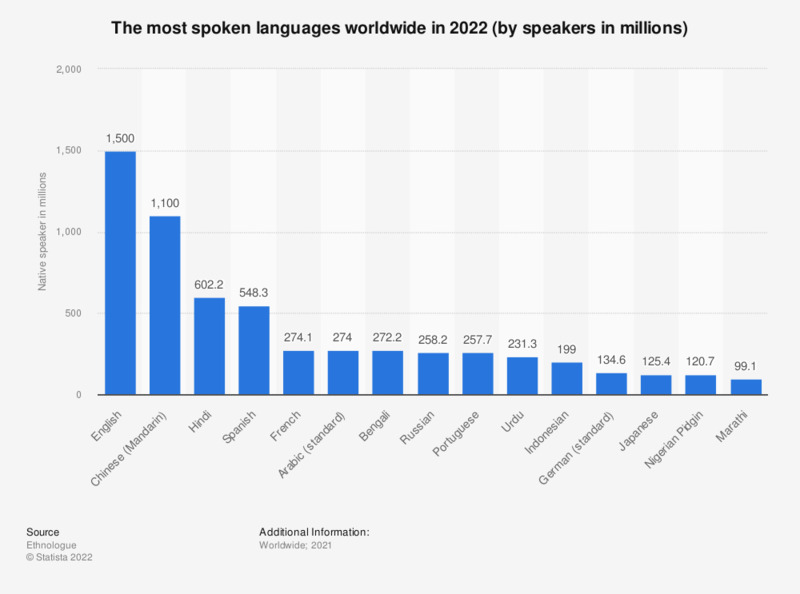 The statistic shows the most spoken languages worldwide. There were around 1.3 billion native Chinese speakers a the time of survey. The United States does not have an official language, but they use English, specifically American English, for legislation, regulation and other official pronouncements. America is a land of immigrations and the languages spoken in the United States vary as a result of the multi-cultural population. The second most common language spoken in the United States is Spanish or Spanish Creole, over 41,017,620 people spoke Spanish at home in 2017. While 3,462,091 Chinese speakers, 917,812 German speakers and 936,344 Russian speakers were counted in the United States in 2017. The primary language use among Hispanics in the United States in 2011, was English for 69 percent of third and higher generation Hispanics, whereas 61 percent of the first generation Hispanics were speaking primarily Spanish. The percentage of people in the United States speaking a language other than English at home in 2017 varies from state to state. The state with the highest percentage of population speaking a language other than English is California, about 44.4 percent of California’s population was speaking a language other than English at home. As of 2017, approximately 21.8 percent of the United States’ population was speaking a different language at home.